I'm in the process of building my 6.5 Creedmoor and I have a few boxes of their 120gr AMAX factory loads, but once those are gone it to the table. I've seen a few loads on here, but they are spread out all over the place. Figured we need a spot for all of them to go. Bullets I'm interested in using are: 130/140 Berger VLD, 120/140 AMAX, 123/139 Scenars, 142 SMK, and 142 Matrix. Haven't decided powder yet, but mostly will go wth H4831sc or H4350. Krieger barrel was very picky, took lots of load development. Bartlien barrel(GAP Chambered) will shoot anything you put in it. I backed down to 2850FPS to save brass life. My krieger loved the 41.5 grains of H4350 with 140 amaxs or 142 smks. loaded to factory length in hornady brass with fed 210s. 24" 4 groove 8 twist. good accuracy from 100 yards out to 800 yards. built on a rem 700 action and mcmillan stock. it did not like the lighter 120 grainers as well. i tinkered with some of em, 123 smks, 123 amax 123 lapuas. none really showed any promise. Does anybody have a load for the 130 Berger VLD or the 130 JLK? How fast are those leaving the muzzle? Are they able to jump a little or do they have to be in the lands, I've heard both? I am guessing you went with 42.4 gr. nice group!! Anybody straying from the factory loads and shooting Bergers? I hate shooting group. But did some today. New gun, new trigger still getting use to it. More to fallow. I have 140 VLD's reloaded and 140 AMAX's to test as well. I love the 140 Amax so far. Might have to give the VLD's a try. Nice shooting by the way. Thanks, I have 140 VlD's next and then 140 Amax's as well. I thinking the Amax's for hunting some, and 140 VLDs for pushing out to 1000 yards. I'll update early next week the 140's. I shot the 140 Amax at 1060 yds today with my Creedmor. They worked great, the Amax is practically a VLD IMO. My 6.5 Creedmoor load is 42.6 grns of H4350, 140 Amax, COL is same as factory. The Amax comes out of the 26 inch barrel at 2835, same as factory. I used an Oehler to check the velocities. No signs of pressure, not even a flattened primer. Most of the time I can still make out the B on the CCI Br2 primer after the round has been fired. Today I did some checking and pulled apart 2 factory 6.5 Creedmoor 140gr cartridges and even though the box says there is 41.5 gr of H-4350, we measured 42.4 and 42.6 gr of powder. I'm pretty sure this matches what others have found when they pulled bullets as well. Mostly shot the factory 140 load out of a 24" barreled Noveske AR-10. Great results out to 1k. I find the idea H4350 is too slow in autoloaders laughable, I've never seen a bolt come out of an AR platform so clean in my life. I've noticed alot of guys are going with the CCI primers. Any reason behind this? I've always used Fed210M's, but with this new Creedmoor, I think I'm going to get a box of the CCI BR2's and test them out. Base to ogive - 2.190"
Before this I almost gave up on the A-Max because I kept getting two shots that would touch and then a flyer. It seems like the Scenar 139 is gaining favor with many Creedmoor shooters, with this new found success I'll be sticking with the A-Max. I've noticed at matches and in talking with people that the Scenar is becoming more prevalent. Just an observation, do you disagree? Not at all... I know of a few guys who run the 123 an 139 Scenars out of 6.5x47's, and they love the accuracy. I personally haven't seen anyone around here or in this thread post about using them yet. Excellent shooting. Do you happen to know your velocity with that load? I am shooting the 123 Lapua Scenars with 39.5 of Varget and Fed 210M primers @2880-2900 and the accuracy is outstanding (though somewhat larger groups than RW71's). It holds its own out to 800-900 yards but at 1K it gets pushed around a lot despite what the tables may say. 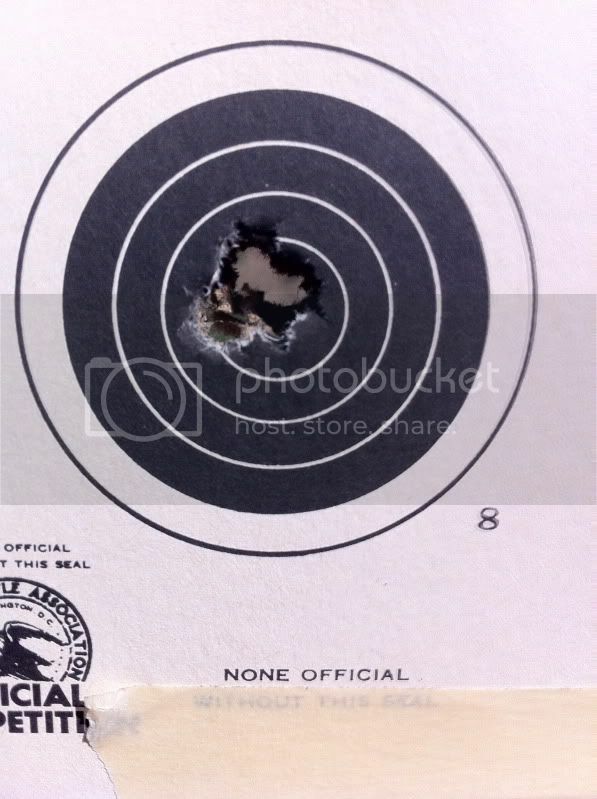 The group below is not uncommon for five shots at 100.
but it was just too hard on the brass for my budget. My velocity is now 2827 over the Oehler chronograph with a 26" barrel. Thanks for sharing your data George Mac. Going to load up a test series of this load. Hopefully I can get same accuracy as you have. Just another data point from my AI AE Mk3 in 6.5CM with a factory 24" Bartlein barrel. Factory 140 Amax loaded ammo went over the chronograph at 2775fps avg for 20 rounds and dope out to 600 tracked the chronograph very well. Accuracy was about 1/3 MOA at 300Y. The same day I tested some handloads with fresh 6.5CM brass, GM210M primers, 140 Amax seated .010 off the lands (2.170 to ogive), and 41.5gr H4350. This was a duplicate of the "on the box" factory load with the exception of the bullets seated out about .025 longer to put them .010" off the lands. These loads averaged 2705fps over the chronograph for 20 rounds and the dope out to 600 tracked the chronographed 2705fps very well. Accuracy of this load was also about 1/3 MOA at 300Y. The velocity variance between the factory loads and my loads may have been a lot to lot variance of H4350 or as others have noted the factory Hornady loads might really have about 42.4-42.5gr powder instead of the 41.5gr marked on the label. I didn't pull any of the factory ammo to check the charge weights. Next time I head to the range I'm going to try a little more powder to try to match the velocity of the factory ammo. I'm really liking the 6.5CM in terms of easy load development, performance, and the availability of very accurate factory ammo. 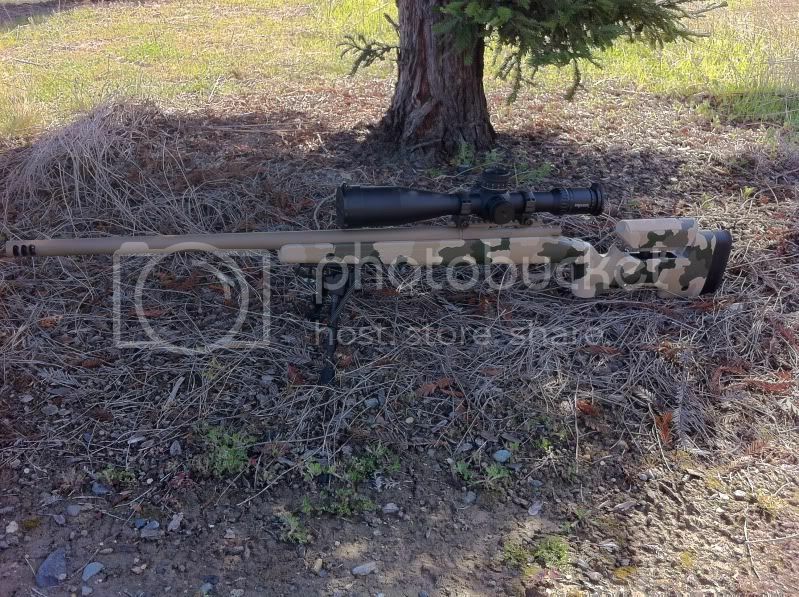 I'm probably going to sell my .308 Armalite AR10 and have GA Precision build me a GAP-10 in 6.5CM. I can't see shooting my .308s much anymore! <div class="ubbcode-block"><div class="ubbcode-header">Originally Posted By: Kiba</div><div class="ubbcode-body">The velocity variance between the factory loads and my loads may have been a lot to lot variance of H4350 or as others have noted the factory Hornady loads might really have about 42.4-42.5gr powder instead of the 41.5gr marked on the label. I didn't pull any of the factory ammo to check the charge weights. Hornady loads to a velocity/pressure spec and depending on powder lots it might be more or less than the 41.5grns listed on the box. 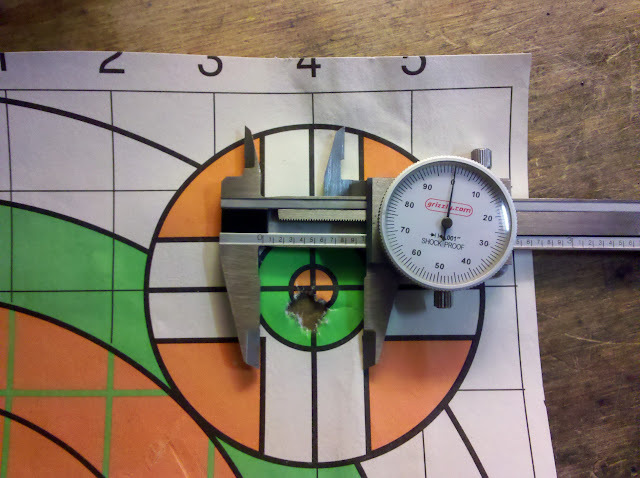 41.5grns is a good place to start if handloading the round. You just can't expect them to relist the powder charge evertime for each lot. Tag...thanks for sharing guys. Looks like the general consensus is save the $ and stick with the Amax's. This is actually a really good thing for me because I have a buddy who was harassing me for considering Amax over Berger just because of the cost savings. Inthe process of gathering pieces for a 6.5?? Build. Any preferences on bbl twist. I have noticed both 8 & 8.5 tw being used. Just curious what the line of thought was. It would be nice if Hornady decided to make a 130 Amax. <div class="ubbcode-block"><div class="ubbcode-header">Originally Posted By: Rob01</div><div class="ubbcode-body"><div class="ubbcode-block"><div class="ubbcode-header">Originally Posted By: Kiba</div><div class="ubbcode-body">The velocity variance between the factory loads and my loads may have been a lot to lot variance of H4350 or as others have noted the factory Hornady loads might really have about 42.4-42.5gr powder instead of the 41.5gr marked on the label. I didn't pull any of the factory ammo to check the charge weights. upon dissassembly of factory 140 amax the charges are averaging 42.4-42.6 gr fwiw. i am averaging 2810-2815 out of my 26" rock 8tw with the factory stuff. I push the 140's through a Brux 8.5 twist. No pressure at all at 1100 ASL and 80 degree temp. 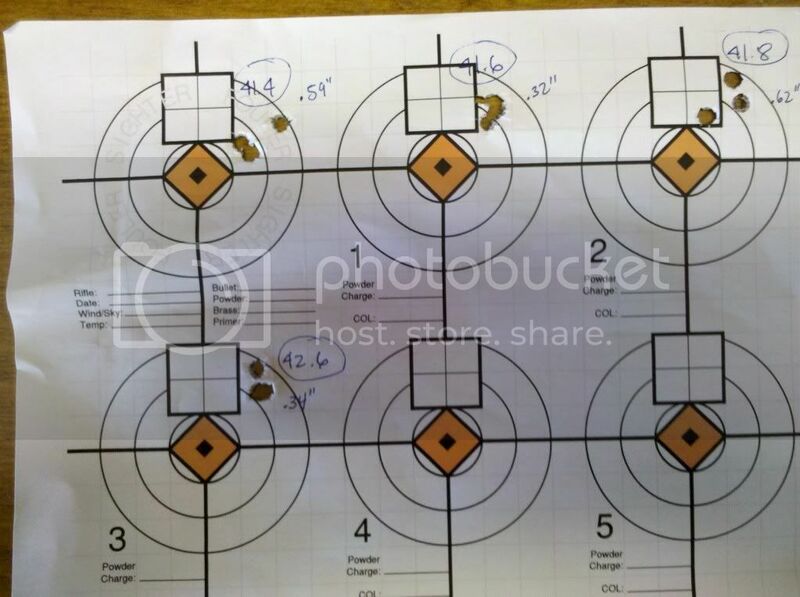 I found a good node at 42.9 at 100yds, then did a bullet seating test at 500. Started jumping about .025 and decreased jump by .005 for each test. Groups continually got smaller as I approached the lands. Not much difference in .005 and .010 jump, but it was very clear that they like the .005 to .010 area. 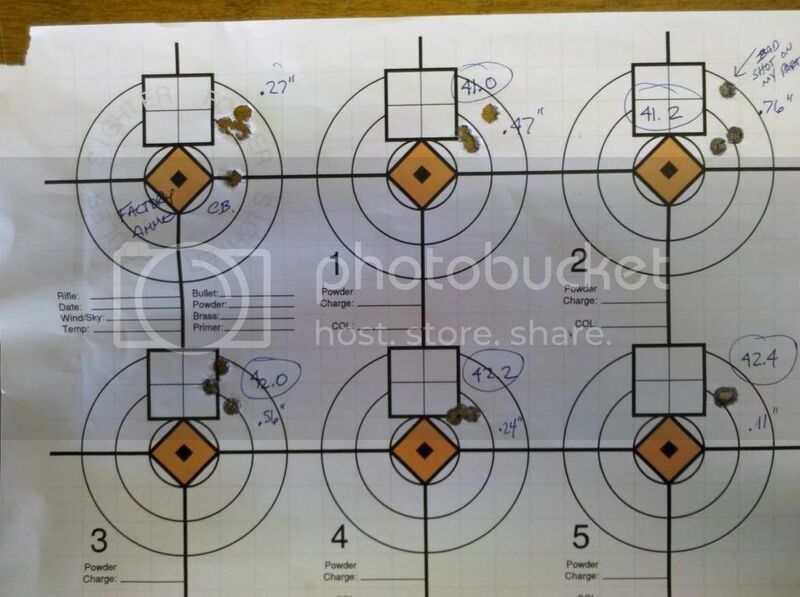 The groups in the sweet spot were about .5moa smaller than all other groups. 5 shots at 500. I switched from 140 amax to Berger 140 match and 500 yd group dropped from 4 in. to 1.5 in. Yep. Finally found a great one hole load. Thank you. Please keep us posted on how the load performs @ long distance. anyone using the 140 berger hybrids yet? i know they are hard to get just wondering what the groups were like compared to the almighty 140 amax... ?? post pics and data if you have it! With everyone's input thus far, is the factory ammo worth focusing on or are the hand load results far better? My build will be complete soon and I was looking to shoot the factory ammo. I'd like consistent results. I have 400 rounds in the cabinet already. if I need to buy dies, I can move that way too.